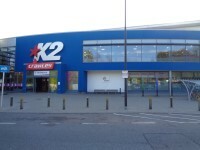 K2 is one of the leading leisure facilities is in the South of England offering a 50 metre swimming pool, indoor rock climbing, state of the art gym and conference rooms. 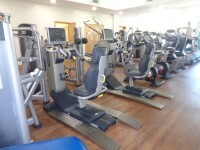 Services / facilities within the building include a learning pool, fun pool, olympic size pool, indoor bowls, fitness suite, steam room, squash courts, climbing wall and a gymnastics hall,. 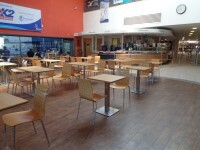 Services / facilities within the grounds include athletics track and field, football pitches and tennis courts. The venue is open 08:00 to 18:00 on Bank Holidays. The nearest National Rail station is Crawley. 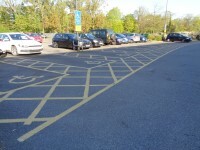 The dimensions of the Blue Badge parking bay(s) are 320cm x 460cm (10ft 6in x 15ft 1in). The nearest Blue Badge bay is 25m (27yd 1ft) from the main entrance. 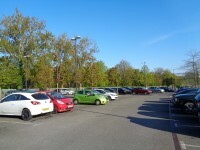 The furthest Blue Badge bay is 55m (60yd 5in) from the main entrance. 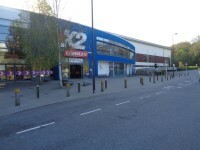 The drop off point is located at the front of the venue. The width of the door opening is 190cm (6ft 3in). 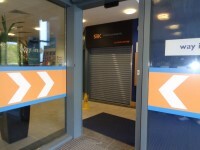 The width of the security gate at the reception is 90cm. 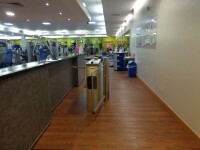 Music is played throughout the main areas, fitness suites and studios. 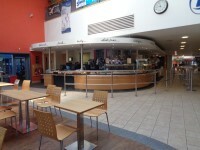 The cafe is located to the left of the reception desk. 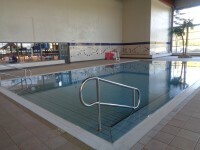 The learning pool has five well marked shallow steps to access the pool. 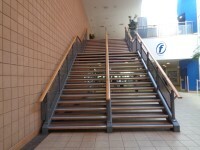 There are handrails at both sides of the steps. 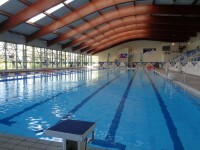 The depth of the learning pool is 0.9m. You are on Changing Places (Changing Village). Skip to the next section. The facility is located to the far right of the changing village. The facility is approximately 49m (53yd 1ft) from the main entrance. The width of the door is 100cm (3ft 3in). The dimensions of the facility are 230cm x 200cm (7ft 7in x 6ft 7in). The transfer space on the left as you face the toilet is 110cm (3ft 7in). There is a adjustable shower and a fixed shower within the changing place. You are on Accessible Changing Room (Changing Village). Skip to the next section. The facility is 49m (53yd 1ft) from the main entrance. 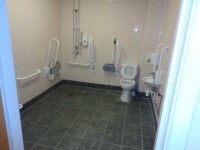 The dimensions of the accessible changing room are 270cm x 230cm (8ft 10in x 7ft 7in). The toilet seat is 45cm (1ft 6in) above floor level. The height of the sink is 65cm (2ft 2in). There is not a changing bench. The facilities available in the accessible shower are an adjustable shower head, a shower chair, a flip down seat and a fixed seat. The height of the seat is 45cm (1ft 6in). Dropdown rails are also available for the wheel in shower. There are three unisex accessible changing rooms within the changing village. 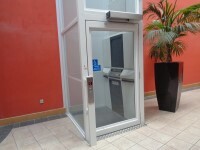 A RADAR key is required for the accessible changing rooms. 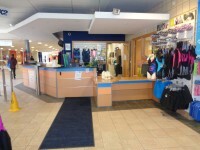 The key can be obtained from the main reception and the health & fitness reception. Lockers are located outside the accessible changing rooms. You are on Standard Changing Room (Changing Village). Skip to the next section. 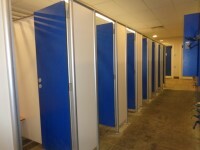 The standard changing room(s) is/are approximately 35m (38yd 10in) from the main entrance. 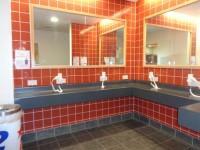 The standard changing room(s) is/are approximately 23m (25yd 6in) from the reception desk. 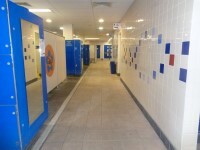 The standard changing room(s) is/are approximately 8m (8yd 2ft) from the pool side. 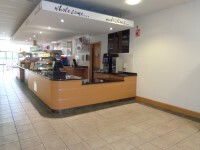 The standard changing room(s) surveyed is/are located past the cafe, to the left. 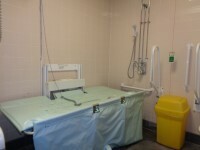 The baby change unit are located within the changing rooms. You are on Lift (Standard). Skip to the next section. The lift is located in the centre walkway. 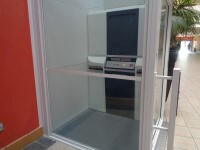 The clear door width is 75cm (2ft 6in). You are on Lift (Platform). Skip to the next section. 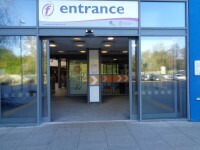 The lift is located within the centre walkway. 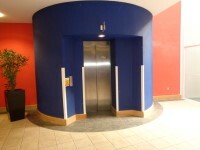 The lift is approximately 38m (41yd 1ft) from the main entrance. 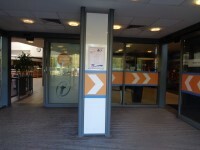 You are on Reception (Fitness Suite). Skip to the next section. 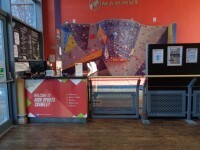 The desk/counter is 32m (34yd 2ft) from the first floor lift. 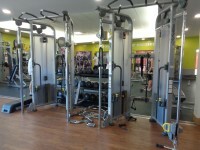 The fitness suite is 25m (27yd 1ft) from the lift. The opening is 160cm (5ft 3in) wide. The fitness suite has attained IFI level one. A number of staff have received IFI Mark standard Disability Equality Training. IFI accredited equipment is available. For example: treadmill, upright cycle and recumbent cycle. IFI equipment includes free weights. There is not clear manoeuvring space between equipment. You are on Accessible Changing Room (Fitness Suite). Skip to the next section. 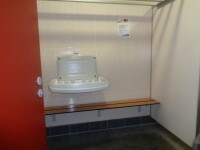 The accessible changing room is located in the female changing room. There is an identical facility in the male changing room. 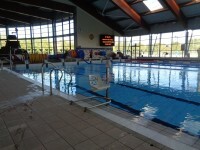 The facility is 24m (26yd 9in) from the fitness suite. 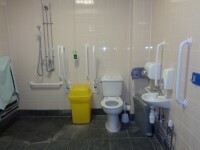 The dimensions of the accessible changing room are 180cm x 200cm (5ft 11in x 6ft 7in). The height of the sink is 72cm (2ft 4in). 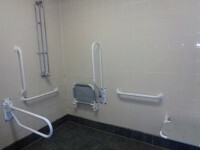 The facilities available in the accessible shower are handrails and a fixed seat. You are on Standard Changing Room (Fitness Suite). Skip to the next section. The standard changing room(s) is/are approximately 55m (60yd 5in) from the first floor lift. 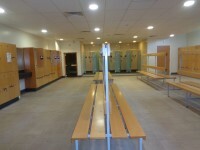 The standard changing room(s) is/are approximately 24m (26yd 9in) from the fitness suite. The standard changing room(s) surveyed is/are located to the far right from the reception deck. There is not level access to the shower facilities. The shower cubicle(s) / area is / are accessed via a shallow step. 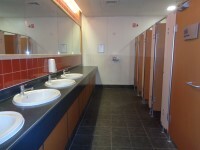 The standard female and male changing rooms are located next to each other and are of the same layout. You are on Accessible Toilet (Reception). Skip to the next section. This accessible toilet is located to the right of the reception desk. The width of the accessible toilet door is 100cm (3ft 3in). 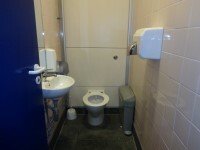 The dimensions of the accessible toilet are 155cm x 240cm (5ft 1in x 7ft 10in). 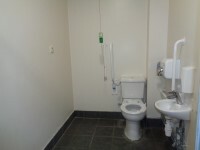 There is a similar accessible toilet located to the right of the reception area, with the lateral transfer space on the left. You are on Accessible Toilet (Changing Village). Skip to the next section. 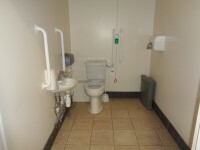 This accessible toilet is approximately 32m (34yd 2ft) from the main entrance. 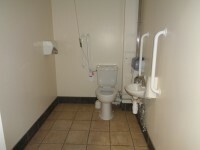 This accessible toilet is located within the changing village. 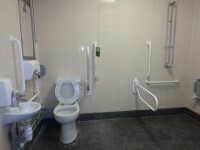 The accessible toilet is located within the accessible changing room. You are on Standard Toilet(s) (Changing Village). Skip to the next section. The male toilet facilities that were surveyed are located within the changing village. 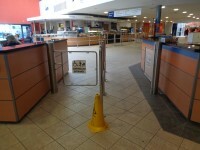 The male toilet(s) is/are approximately 40m (43yd 2ft) from the main entrance. The female and male toilet facilities that were surveyed are located within the changing village. The female and male toilets are approximately 60m (65yd 1ft) from the main entrance. You are on Standard Toilet(s) (Fitness Suite). Skip to the next section. The female and male toilet facilities that were surveyed are located in the main corridor. The female and male toilets are approximately 20m (21yd 2ft) from the lift. 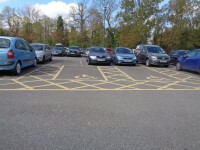 The assistance dog toilet area is located in the grass area to the rear of the car park.